By irezumi, March 12, 2012 in Worst Tattoo EVER! Pretty much all of us understand and on board with the failing of backward tattoos. Why is backwards lettering so over-looked or dismissed by a lot of us? None of us are innocent on us, don't get me wrong. Some of us even wear it. But once I was taught about the proper method, I have never done it otherwise. And now when I see it, it's the thing my eye is drawn to the most, no matter how good the rest of it is, or who did the tattoo/drawing/painting/whatever. I'd say that 1/3 or more people I have worked with don't know this, or have adapted to not caring even if it is pointed out. I understand the concept of missing the forest for the trees, but it's not too hard to stick with it after someone showing you. You can only do so much dude, I say it's nice of you to offer advice but if they don't wanna listen, they don't wanna listen. Some of us even wear it. do you mean upside down word tattoos? No, the typeface we all use for letting in banners and signpainting and such is an adaption of Times New Roman. If you look at an example of that font vs many letters in tattoos and knuckles esp you will notice the most glaring of all, the commonly incorrently drawn 'A'. Same also for M, N, S, U, V, W, X, Y. Pretty much anything with an open end up or an open end down. @irezumi, when you have time, you should post examples. This is a great topic and one that I know sign-painters can talk about all day. I don't really get what you mean.. I don't understand how someone could draw an capital A or Y backwards since they are symmetrical. Do you mean people putting the flourish coming off the wrong end? Or putting the double line (tradition tattoo style) on the wrong side? Or putting the double line (tradition tattoo style) on the wrong side? Tell her what she's won, @irezumi! You've won a set of eight correctly sided letters, suitable for knuckle use. If I may be so bold, I suggest you get AND SEW ON. From what I understand, the downstroke should always be the heavier side - such as the right leg of the A, the middle stroke of the N, The left middle and final stroke of the M, and so on. These three letters are the ones I see backwards most often. This is what we are talking about, right? notice the same letters in this "tattoo font"
When I was a kid and read comics non-stop, I always wanted (and dint really quite understand for a while) to win the Marvel® No-Prize for catching errors ad contradicting storylines. Urs, you win the No-Prize I never got. some of us are on the verge of alzeimers.......hhuuhhh??? yep, sorry about that @Shannon Shirley i was going to point out the specific letters but since it had kinda been mentioned i got lazy. 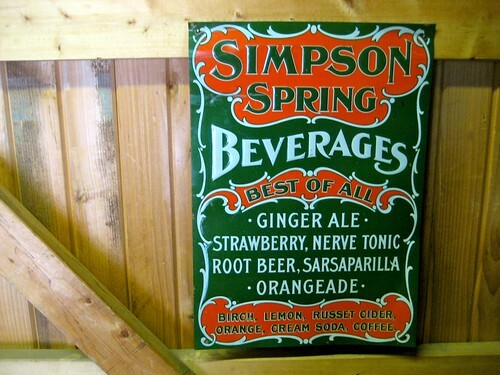 it's noticeable on the font used on sampson spring and beverages. and by the way, I loved this thread,Irezumi.....this is what its all about....learning and listening...yee haw!!! I am never too experienced to learn something new, and always humble enough to ask a friend/co-worker what they are doing when they do it better than me.